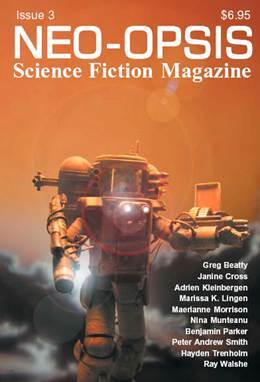 The third issue of Neo-opsis Science Fiction Magazine is 8” by 5 ½”, 80 pages. Published on July 8, 2004. Adrian Kleinbergen is the creator of the cover art for issue three. Adrian is a wonderfully diverse Canadian artist, born in Edmonton, Alberta in 1961. Along with drawing and paint­ing, he does jewelry design and manufacture, sculpture, caricature, writ­ing, costuming, and even magic. Adrian considers himself a single-combat warrior in the muddy trenches of comicdom. He started in comics in 1987, penciling, inking and coloring "Starstone" and "Darkewood" for Aircel Publishing in Canada. He ran his own comic publish­ing com­pany, "Ground Zero Graphics”, which published "The Shadowalker Chronicles" in 1991. Adrian has been the primary artist and a column­ist for the national magic maga­zine, "The Servante". He was one of the original artists for “On Spec” magazine, doing both covers and interior art. Adrian’s latest project is a graphic novel, “Frontiers” written and drawn by Adrian and published by MU Press, in Seattle, WA. Editorial “Movie Verbosity”, by Karl Johanson, gives us all a little insight on how we can deal with those people who want to tell us everything about a movie before we get a chance to see it. This issue’s “Letters to the Magazine” includes: more senses to add to the five, a science question about whether a mug of water can explode after it is removed from the microwave, compliments to the art, request for another copy, and more. “A Walk Through The Periodic Chart: Erbium, Terbium, Yttrium & Ytterbium” by Karl Johanson, even includes a limerick. Karen Kazanowski’s cartoon characters “Buzz ‘n’ Toffee” take an interest in the Periodic Chart, and two more of Karen’s cartoons give us a pictorial understanding of conductors. The first story in issue 3 of Neo-opsis Science Fiction Magazine is “The Luck of Willie Lumen” by Hayden Trenholm, (5200 words – Short Story) with an illustration by Stephanie Ann Johanson. Hayden is both a playwright and a prose writer. In the past ten years, he has written over 15 plays with productions across Alberta and on CBC radio. His short fiction has appeared in On Spec, TransVersions, Tesseracts 6 and on CBC radio. In 1992, Anvil Press published his novel, A Circle of Birds. He lives in Ottawa where he does research for the Senator for the Northwest Territories. The second story is “Dreamcatcher Bisque” by Greg Beatty. (820 words – Short Story) Greg is a freelance writer, writing fiction, non-fiction, and occasionally poetry. His fiction tends to be genre fiction: science fiction, fantasy, horror, or some variation thereof. Here is a link to a list of his fiction publications. Much of Greg’s non-fiction writing deals with genre fiction, but he also writes on American literature and culture, spirituality, rhetoric, pedagogy, and science, and has published a number of personal essays. If you’re interested in this area of Greg Beatty’s writing, here’s a partial list of his non-fiction publications. The third story is “A Time for Everything” by Peter Andrew Smith, (3384 words – Short Story) with an illustration by Benjamin Parker. Peter enjoys reading and writing speculative fiction stories. He and his wife Meredith currently live in Quispamsis in New Brunswick. They share the house with their two dogs, Willie and Barkley. The dogs enjoy providing both critique and inspiration for some of Peter's work. His wife does as well and is generally more helpful since she can speak. Peter's fiction has appeared in various magazines and anthologies including What If?, Beyond Centauri and New Brunswick Short Stories. The fourth story is “An Attack of Conscience” by Marissa K. Lingen, (3376 words – Short Story) with an illustration by Benjamin Parker. Marissa is a freelance writer living in Minnesota after four years of exile in California. In '99 she won the Asimov Award and has since been publishing short stories, essays, articles, textbooks, and just about anything else she can convince editors to print. She is currently at work on a fantasy trilogy about vacuum-tube computing, Cold War spies, and Finnish mythology. The fifth story is “Virtually Yours” by Nina Munteanu, (3458 words – Short Story) with an illustration by Stephanie Ann Johanson. Nina is an internationally published author, whose fiction and non-fiction has appeared in publications throughout United States, Canada, the UK, and Romania since the 1980s. Publications include, among others, Bram Stoker award-winning Chiaroscuro, GateWay SF, Hadrosaur Tales, and Dreams & Visions. Her short story, "Angel's Promises", was nominated for the Speculative Literature Foundation (SLF) Fountain Award in 2004. She is a member of SF Canada and also serves as assistant chief editor of Imagikon, Romania's only totally English webzine. Nina is a scientist with an environmental consulting firm in Vancouver, B.C., and regularly speaks at conferences and publishes papers on the environment. She lives in rural Ladner, British Columbia, with her husband and son. The sixth story is “The Power of Love” by Janine Cross, (3986 words – Short Story) with an illustration by Stephanie Ann Johanson. Janine set out to bicycle around the world and 2 years and 22,000 kilometres later, she returned to her hometown of North Vancouver, BC. Since then she has sold short stories to various Canadian magazines, was a quarter-finalist in Ron L. Hubbard's 1997 spring session of the Writers' of the Future contest, and was nominated for an Aurora Award in 2002. She's sold non-speculative fiction to the National Post and the anthology `Shorelines', and Beach Holme Press will be publishing her latest novel, a literary comedy, Fall 2004. She has just signed a very exciting contract with New York agent, Caitlin Blasdell, concerning a fantasy trilogy. The seventh story is “Legacy Troll” by Ray Walshe, (2833 words – Short Story) with illustration by Karl Johanson. Ray is a Southern California native whose prior publishing credits include five published short stories in the Orange County Register Dreamscapes series story contest, and a children's horror story published in the San Gabriel Valley Tribune Halloween short story contest (all in the mid-to late 1990's). Ray lives in Chino Hills with his wife and two children and recently resumed writing short stories while talking a break from his work on a dystopian novel about political correctness and our disconnected modern world taken to extremes. Issue three has a new section, “Artist Spotlight”, which this issue includes three works by artist Maerianne Morrison, “Frog Prince”, “Captured”, and “Battle Damage”. Maerianne lives in Montreal with her boyfriend and miniature schnauzer; she works as a freelance illustrator specializing in science fiction and fantasy art. Maerianne works mostly in graphite and watercolor. She uses her art to express her sense of esthetics, morality, or occasionally her morbid sense of humor. Issue three includes a grayscale version of the painting “Pacific Morning” by Stephanie Ann Johanson. In news, issue three includes a list of the 2003 Nebula Awards Winners, and a list the 2004 Hugo Award Nominations. The reviews in this issue are for: the novel “Throne Price”, the novel “Burndive”, and the movie “Comic Book: The Movie”. “Maynard and the Cheese” a cartoon by Karl Johanson, shows a different angle on talk radio. Copies of this issue are still available.